I found the original recipe demonstrated on Lillian's Test Kitchen she makes things while being video taped. She's much braver. She found the recipe at Elana's Pantry. If you want to know how to make it with raisins you'll find the information there. 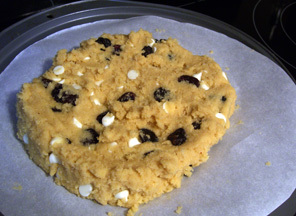 I changed it by adding dried bing cherries and white chocolate chips. Mix together the Blanched Almond Flour, Celtic Sea Salt, Baking Soda,,Bing Cherries and white chocolate chips in one medium bowl. 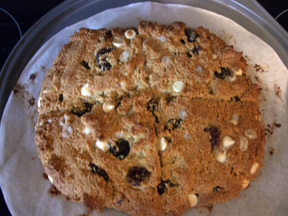 It turned out really well, much like a scone. I froze some of this and microwaved it straight from the freezer and it was still yummy. Thanks for the shout out! Your version looks delicious!